This is for chapter news. The AMWA Salary Survey is open! Please participate to share your insight on salaries and fees. All AMWA members should have received a link to the online survey by email from amwa@associationresearch.com on Friday, February 22. All medical writers, editors, and communicators are invited to contribute to this important research. For an invitation, please contact salarysurvey@amwa.org to request one. Explore Frequently Asked Questions to learn more about the survey, including some tips on how to prepare. You may also contact salarysurvey@amwa.org if you did not receive the link or have any other questions. 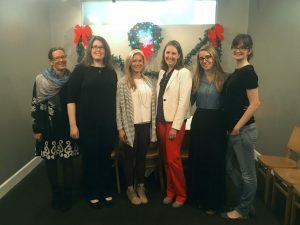 AMWA-SE members gathered at Germantown Cafe in Nashville to network, discuss the accomplishments of the year, and share ideas for next year. More educational events and other fun activities (like yoga!) were popular with the group. The Disney magic was alive and well as the Southeast Chapter met for dinner and networking at the Medical Writing and Communication Conference 2017 in Orlando, Florida. Twelve members attended the dinner, including five who were first time chapter event attendees. There was plenty of lively discussion and excitement about more local events in the coming year! 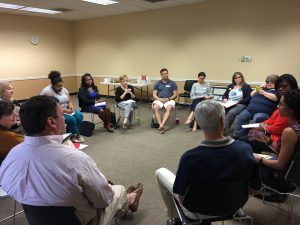 On September 27, 17 attendees (6 current AMWA members, 11 prospective members) met at the Georgia Public Library in Sandy Springs. Several of the attendees were graduate students who are interested in medical writing as a career. The attendees generally had positive feedback about the meeting and are looking forward to having more meetings and social events. In fact, several of them agreed to work on planning an event for early November. Three AMWA members met in Nashville to discuss the current book club selection: The Immortal Life of Henrietta Lacks by Rebecca Skloot. Discussion topics included racial disparities in health care, informed consent, how medical writers can tell patient stories, and the responsibilities of scientists to balance the “common good” with individual rights. Additional discussion is planned for the book club google group. 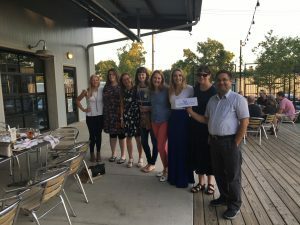 On August 25, nine AMWA members (including one new member who traveled from Mississippi!) met at Fat Bottom Brewing in Nashville. Discussion items included transitioning to medical writing, regulatory writing opportunities, and self-promotion best practices (business cards, LinkedIn, etc). It was a lovely night to enjoy the patio space!